When we talk about helping people who are in dire need, the first thought that would probably come to our mind is by helping them with money. In general, it is true that money is the main factor when lending a hand. However, helping people isn’t just only by giving money. It can also be delivered via our good actions. We can make a change to someone’s life physically and mentally by the little things we do. This refers to helping people by doing action that may seem small instead of giving money. Here are 2 examples in lending our hands to help people without costing a huge amount of money. First, when we teach an illiterate person with a simple knowledge of ABC. This sounds very easy, but who knows the person that we help with knowing ABC today, can be someone who is beneficial and gives back to his/her community in the future. This ripple of kindness is started with simple action, but when it is done continuously, it will bring impact to the society. I had an experience in teaching Mathematics and English to a group of orang asli kids. These kids merely have the opportunity to learn English at school and it was really hard somehow for me to get closer to them. Then I realised that I should be putting myself in their shoes so that they can adapt and understand what I am talking about by using a different approach. I taught them simple English through games and that made them happy as we were laughing together. I have little prior knowledge in teaching but I did what I could as long as the kids are happy and enjoy my presence. That was my first step to get closer to them. In the next session, I managed to get their attention and eventually all the one-month teaching sessions goes smoothly. I can see the progress of these kids session by session. They were so eager to learn. They loved it when I reward them with small stars at the bottom of their workbook when I marked their books. I did not do anything big, but it was enough to make them happy. Seeing how happy they were made me feel even happier. People wouldn’t mind the amount of money you spend if you want to help them or even buy them something because different people have different ways of how they value things. What people will see is how often you keep helping others even via small action. The aforementioned example given is about teaching simple ABC to an illiterate person. If you are not interested in teaching, there are other ways to help people through our small deeds. Each and every one of us is special and has our own capability and skills. And why not, we help people by establishing and utilising our skills to the max. It doesn’t matter if we don’t have much money to help people, as long we are passionate about it and can make it as our habit. Second example is to bring some candies in our bag whenever we plan to go out. Just in case we meet kids on our way, we can just simply give the candies to them. Not necessarily given only to the kids, it can be anyone we meet along our way. Give them with a smile and say to them ‘have a great day’ or ‘today I received a good news and I want to share my happiness with you by sharing these candies with you’. The receiver will surely pay you with another beautiful smile. In my case, whenever I go travelling, I will bring extra snacks in my backpack to be given to anyone I would meet along my way, especially the kids. Most of the time, kids that I met would not feel awkward to accept my gift, as well as their family members. That is how I started my greetings with the people around. Then I noticed that, this is one of the effective ways to break the ice with the locals when we get ourselves to a new place. If we always think that ‘I don’t have the money to help people’, then we will be stuck in the middle of nowhere and not able to help others whereas the rest of of us are already far in contributing to the society. Keep doing good deeds until it becomes in our blood that we ought to feel something is missing if we left it behind. Muznah joined MYCorps South Asia Mission last year. She graduated from the International Islamic University of Malaysia (IIUM) in Business Administration. 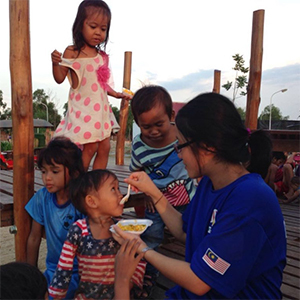 Prior to joining MYCorps South Asia mission last year, she worked as an admin executive.